Professional, comprehensive water and dialysate quality analysis for hemodialysis. 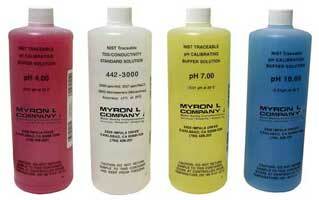 Since 1957, the Myron L® Company has designed and manufactured highly reliable analytical instruments for a wide variety of demanding applications. Thousands of professionals around the world rely on the performance of our instruments every day. Myron L® is also the manufacturer of the original Dialysate Meter™, trusted by Hemodialysis professionals for over 40 years. 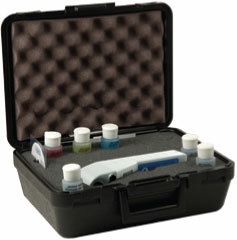 And we offer a full line of portable handheld testing instruments and monitor/controllers for every aspect of water quality analysis and control. The new Digital Dialysate Meter is designed to simplify testing across a variety of applications in your clinic: Dialysate Testing, Water Quality Control, System Disinfection, Equipment Calibration and Effluent Monitoring. This instrument does the work of up to 7 different instruments, with fast accurate results and user-intuitive interface. 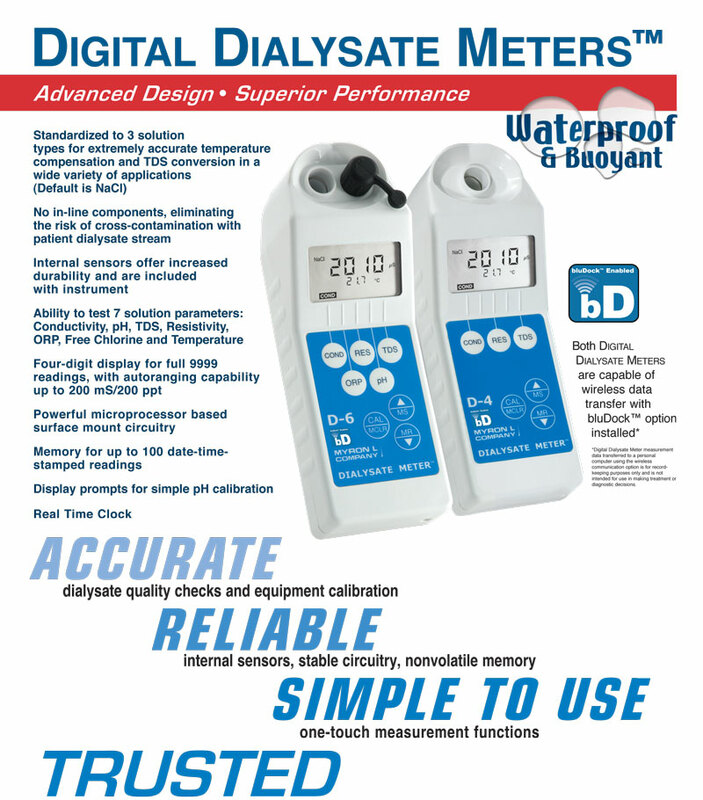 The D-6 and D-4 Digital Dialysate Meters are specifically designed to test both acetate and bicarbonate dialysate quality. There are no strips or reagents that expire or subjective interpretation of results. Measurements display immediately. 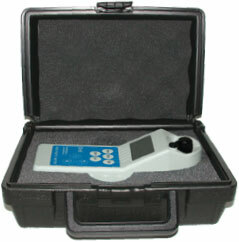 Digital Dialysate Meters are a cost effective solution for your clinic’s water treatment testing. Manage Reverse Osmosis Systems, DI Banks, Chlorine Removal, Ultrafiltration and other processes required for dialysate grade water. Test Conductivity, Resistivity, TDS, pH, ORP and Temperature of feed and product water in unit processes. Use measurements as independent checks against automatic systems of control and for monitor/ controller calibration. 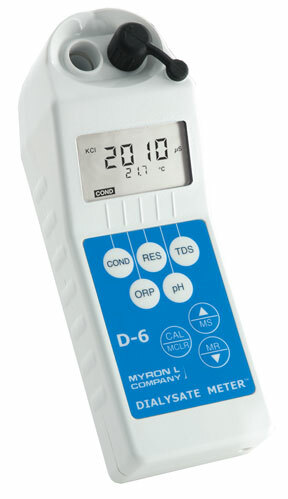 Myron L®’s Digital Dialysate Meters deliver results when you need them where you need them. Monitor levels of residual (oxidizing/reducing) sanitizer during system maintenance. Use ORP and Free Chlorine parameters to ensure proper concentrations in disinfection loops and for jug disinfection. Ensure removal of disinfectant from hemodialysis systems and storage tanks after rinsing. 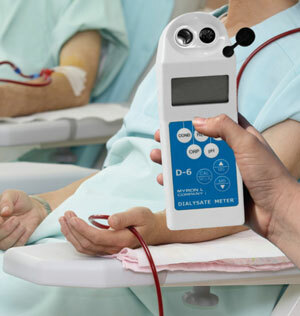 Digital Dialysate Meters are a fast easy way to calibrate hemodialysis machines. Both instruments deliver accuracy of ±0.01 pH unit and ±0.1% of reading at calibration point for Conductivity, Resistivity and TDS readings. Digital Dialysate Meters measure water quality parameters that affect the health and safety of the environment. Monitor parameters required by your discharge permit for compliance with federal, state and local regulations quickly and easily. Instruments do NOT need sterilization. Internal sensors require the user to place the sample in the instrument, preventing cross contamination of patient dialysate stream. Temperature compensation and range selection are both rapid and automatic. You immediately get a standard, numerical digital readout — eliminating all subjectivity. Up to 100 date-time-stamped readings can be stored in non-volatile memory. The Digital Dialysate Meter is lightweight, portable, buoyant and waterproof. You never have to return a Digital Dialysate Meter to the manufacturer for calibration. All calibrations are quickly accomplished by pressing the or keys to agree with our NIST traceable Standard Solution. When pH calibration is necessary, display prompts guide the user and make sure the correct buffer is being used. Plus, all parameters (excluding factory-set temperature) have an internal electronic setting that can be used for field calibration and as a check on pH/ORP sensor life. Auto-shutoff maximizes the life of the single 9V battery to more than 100 hours/5000 tests. Non-volatile microprocessor provides data back-up, even when the battery is changed. This assures all calibrations and memory data will be retained. Extended life pH/ORP sensor is user replaceable in the field. Digital Dialysate Meters make it easy to record, analyze, archive, and report water quality data with the optional bluDock™ accessory package. Simply enter data transfer mode and download stored data to any computer through the bluDock software interface. The data can then be imported into any program necessary for record-keeping and analysis. The bluDock is a fast and easy way to comply with record- keeping and reporting requirements. High quality analog handheld D-1 and D-2 Dialysate Meters™ are available for testing dialysate conductivity in both acetate and bicarbonate solutions. bluDock™ Accessory Package includes bluDock™, Macintosh/PC application software for downloading data, dongle and printed instructions. Certificates affirming the NIST traceability of a Digital Dialysate Meter with data are available (must be specified when placing instrument order). Conductivity Standard Solutions are necessary to maintain accuracy and for periodic calibration of conductivity/TDS parameters. All Standard Solutions are NIST traceable for your complete confidence. RECOMMENDED VALUES: NaCI-14.0, 442-3000 (TDS) available in 2 oz/59 ml, 1 qt/1 L, and 1 gal/3,8 L.
pH Buffers are necessary to maintain accuracy and for periodic calibration of pH and ORP parameters. Calibration with pH 7 Buffer is especially important. All pH 4, 7, and 10 Buffers are NIST traceable and are available in 2 oz/59 ml, 1 qt/1 L, and 1 gal/3,8 L.
pH Sensor Storage Solution preserves sensor for longer life. 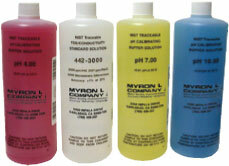 Available in 2 oz/59 ml, 1 qt/1 L, and 1 gal/3,8 L.
Solutions, (NaCI-14.0, 442-3000). * All bottles are 2 oz/59 ml. 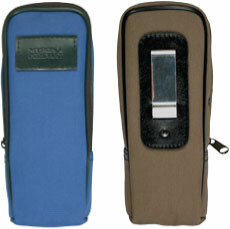 Soft protective case is constructed of padded Nylon™ and features a belt clip for hands-free mobility. Replacement pH/ORP sensor user-replaceable, features a unique porous liquid-junction. 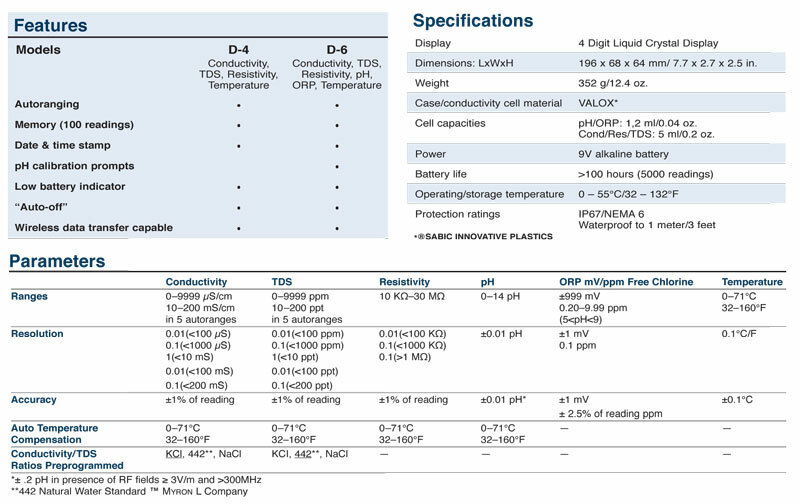 The table below summarizes Myron L® hemodialysis instruments and the applications in which they are used. *** Serial number, or batch number and expiration date must be supplied when ordering.